Our Homefont Emergency Kids 911 Survival Kit is just the answer when it comes to your child�s first survival kit. Our experts designed this kit as if it was for their own children. Are you and your family prepared for a nuclear incident? Health experts believe that the greatest health concerns from a nuclear accident are likely to not be from the initial explosion or spill, but from the release of radioiodine being carried downwind thousands of miles from the original site.When Potassium Iodide is taken it floods the thyroid with a stabilized iodine, preventing 99% percent of the damage caused by radioactive nuclear fallout IOSAT Potassium Iodide fully FDA approved. Buy 10 Packs get one FREE! We have IOSAT Potassium NOW IN STOCK! Not your ordinary survival kit. Homefront Emergency Code Red kits are the "best of the best" in value and quality for Home, Office or on the road. Kits for One person or 20 people, even child kits. Choose the Code Red Kit that is right for you and your situation. Bugout �Out kits, Gamma-Lid re-sealable (water tight) and Port-a-Potti Bucket Kits, Duffel bag and Back Pack Kits. Homefront Emergency is the leading supplier of Mayday survival products, that include a variety of home / office survival kits which will help your family or workplace prepare for all kinds of emergencies including natural disasters, terrorism, earthquakes, tornadoes, and hurricanes. This TWO person FOOD survival kit and SURVIVAL Supplies. Items are packed securely in a Multi-Pocket Hiker's Backpack, which contains extra space available for personal items. Excellent as a GRAB "N" GO food supply for evacuation or part of your preparedness supplies at home. 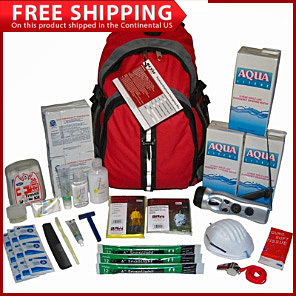 Our "Hip-Pack" Emergency Trauma Kit is perfect for Earth Quake and emergency preparedness! With contents recommended by nurses, EMT's and firefighters, it includes the essentials you need to perform first aid and triage in an emergency situation. Exceeds ANSI Standard Z308.1.2009 (workplace minimum first aid supplies category). --NOW AVAILABLE--NEW 200ml size (6.75oz.) Drinking water. Case of 32--5 Year shelf life--USCG approved. Aqua Blox Purified Emergency Drinking Water Boxes w/Straws CASE of 32 EZ to store water boxes. Simply put our New Survival Packs have been hailed as the "Best of The Best" disaster and emergency preparedness kits for Home or Office. The 5 for 5 will serve 5 people for 5 days with a great selection of Home or Office survival supplies. Don't settle for second best. Order your CodeRED Survival Kit TODAY! are excellent for Disaster and Emergency Kits Back Country Hiking, Travel, Firefighters, Police Disster Aid, Emergency Lock Downs and A FAVORITE FOR SCHOOL EMERGENCY PACKS. CASE LOTS OF 144 BARS Six Flavors to choose from. Each bar is vacu-sealed and has a 5 year shelf life. Welcome to Homefront Emergency. We offer FEMA, Homeland Security, Red Cross and Firefighter approved emergency and survival kits to help you get thru the first hours and days following any disaster or emergency event. Our Survival Kits are reviewed "The best of the best!" by Disaster Specialist and First Responders and are assembled here in the USA. Each kit contains Food Rations, Safe Drinking water, First Aid items, Emergency Lighting, Communications, Hygiene, Shelter and Warmth. Choose from Emergency Survival Kits for School Lockdown, Home Emergency Kits, Office / Workplace Emergency Kits, and Backpack Kits. Why Should I Prepare for an Emergency? In recent years, FEMA and the American Red Cross estimate 60,000 plus natural and man-made disasters occur annually. This includes hurricanes, floods, earthquakes, tornadoes, fires, hazardous spills, civil disturbances, explosions, transportation accidents and terrorism. Emergency services and government agencies may not be able to respond immediately to your needs. History has shown time and again that people who prepare experience less disruption when emergencies occur, and are able to resume their lives more quickly than those who do not prepare. Being prepared can save your life, minimize damage to your property, and help you recover more quickly following an emergency. Remember "When Disaster Strikes...It's too late to prepare"